One of the best ways to adjust to living at Kenyon is to volunteer in the surrounding community. Dec. 1 looms heavily on my calendar. It is the beginning of the holiday season, as well as an unofficial start to when I need to start freaking out about finals. But more importantly, it is the day that (most of) my graduate school applications are due. ’Tis the season for sweaters, pumpkin pie, giving thanks and class registration. 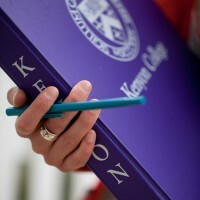 Here at Kenyon, it’s that time of the year when students are planning potential schedules, meeting with advisors, looking up major and minor requirements, and soliciting friends’ opinions about classes. There are so many community service opportunities in Knox County that Kenyon students can get involved in, many of which are related to specific majors and provide invaluable experience. As a political science major at a liberal arts college, most of my classes look at some of the greatest writers and thinkers of all time. We wrestle with Plato, Shakespeare, Joyce Carol Oates and John Locke on a daily basis — so it’s somewhat of a strange thrill to come to a class ready to talk about an episode of Broad City or Transparent.